Hammar, K., Hitzler, P., Krisnadhi, A., Lawrynowicz, A., Nuzzolese, A.G., Solanki, M.
The study of patterns in the context of ontology engineering for the semantic web was pioneered more than a decade ago by Blomqvist, Sandkuhl and Gangemi. Since then, this line of research has flourished and led to the development of ontology design patterns, knowledge patterns, and linked data patterns: the patterns as they are known by ontology designers, knowledge engineers, and linked data publishers, respectively. A key characteristic of those patterns is that they are modular and reusable solutions to recurrent problems in ontology engineering and linked data publishing. 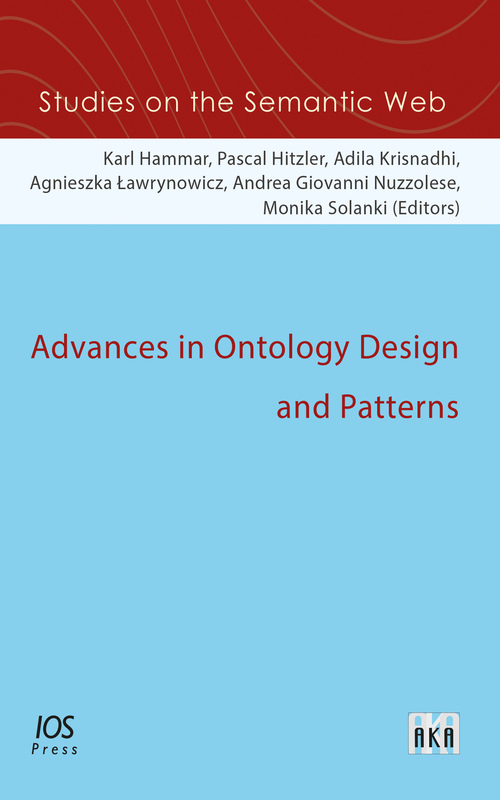 This book contains recent contributions which advance the state of the art on theory and use of ontology design patterns. The papers collected in this book cover a range of topics, from a method to instantiate content patterns, a proposal on how to document a content pattern, to a number of patterns emerging in ontology modeling in various situations.